President and Vice Chairman, Kissinger Associates, Inc. Experts discuss U.S. foreign policy options toward North Korea. Each meeting in the What to Do About... series highlights a specific issue and features experts who present competing analyses and policy prescriptions in a mock high-level U.S. government meeting. MISCIK: Well, thank you and welcome. This is part—this session is part of CFR's What to Do About series. This series is designed to look at a key challenge, hopefully describe it, analyze it, and end by making some policy prescriptions. I'm Jami Miscik, I'm currently president of Kissinger Associates. I spent most of my career at the Central Intelligence Agency. I was the deputy director for intelligence, which means I was in charge of all the analysts. It also means—and the only reason I mention that is because when you're in intelligence you're not allowed to make policy. So I thank the council for giving me the opportunity to play the role of a policymaker here today. (UNKNOWN): You're on the far left. MISCIK: We put you there for a reason. He was in charge of U.S.-South Korean combined command and tasked with defending South Korea from a military threat from the north. I hate to now say this—in the middle we have Ambassador Chris Hill, who was ambassador to South Korea and served as the head of the U.S. delegation to the six-party talks on the North Korean nuclear issue. And we have Scott Snyder, senior fellow for Korea studies and the director of the program here at the council on U.S.-Korea policy. So I thought I would take just a moment to kind of set the stage so everybody's on the same page when it comes to North Korea. And I just wrote down some kind of basics at the glance. North Korea—I'm sorry—the Korean Peninsula was under Japanese control from 1905 to 1945. At the end of World War II it was divided at the 38th Parallel. Three years later, failing to have a unified state, two states were created and the Kim family has ruled North Korea ever since; three generations now. 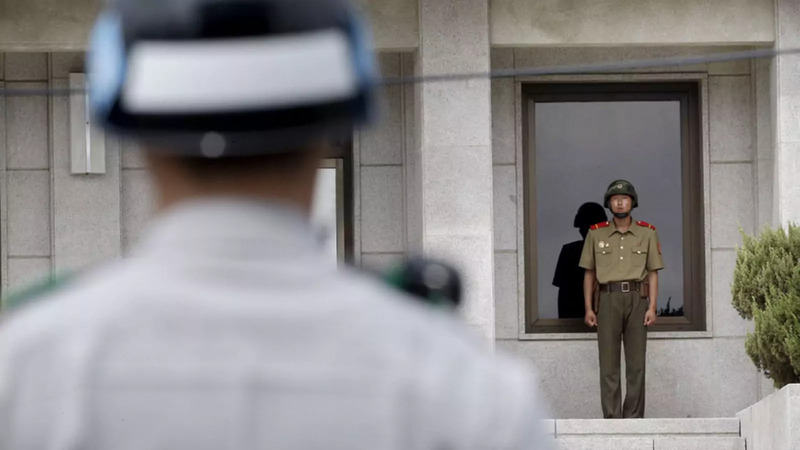 The Korean conflict began in 1950, ended in 1953 with an armistice, not with a peace treaty. North Korea has 25 million people as opposed to South Korea's 50 million. It's GDP per capita is $1,800 a person versus South Korea's $35,400. When it comes to U.S. policy regarding North Korea, the U.S. supports the peaceful reunification of the peninsula. It recognizes the future of the peninsula is up to the Koreans to decide. The U.S. is extremely concerned about North Korea's strategic weapons development and has heavily sanctioned the government for violations of international agreements. Most forms of U.S. economic assistance to the North are prohibited unless they are of a purely humanitarian nature, and there are not diplomatic ties between the U.S. and North Korea. So in talking about North Korea, you almost always have to start with the Kim family. You had Kim Il Sung, the great leader, who died in 1994. Many countries try to make a leader for life. North Korea has gone a step further: they have made him eternal president. His son, Kim Jong-il, the dear leader, had 20 years of on-the-job training preparing to be his father's successor. He died in 2011, and it is his son—the new leader, for lack of a better title, or the great successor as he was originally called—he is the second son of a consort, somewhat of a surprise as a choice. He was in his late '20s when chosen and very inexperienced. So, Scott, let me start with you. He has now been in power for 3-1/2 years. What's your assessment, and what do you think his plans and intentions are for North Korea? SNYDER: So a lot of people, when they start to talk about North Korea, they start exactly where you did with the idea of family continuity in terms of succession. But I think what's really interesting about Kim Jong-un is the discontinuities with his father and with his grandfather. And I would focus in three areas. One is psychology. When you ask people what they think about Kim Jong-un, North Korea watchers, the first word you almost get is "impulsive." He's a risk-taker. There is an element of surprise to what he does. You can even see it in terms of what he says in the official media. And this is very different from his father and grandfather. I think the second aspect is related to his leadership style. In many respects, Kim Jong-un is truly peerless because he did not come up with a leadership group inside the country. Kim Il Sung had a set of revolutionary cohorts who were with him. Kim Jong-il essentially populated the leadership. But Kim Jong-un doesn't really have anybody who can restrain him. And there are two jobs you don't want in North Korea; number two, or envoy because those are very dangerous position. And then I think—and this is the challenging part—Kim Jong-un's strategy is laid out through a term that is called "jungjin" (ph), which is basically the simultaneous pursuit of nuclear and economic development. Essentially what this means—so the good news is that he is trying, in his own way, to improve the economic situation inside the country. But the bad news is that the North Korean nuclear program has actually become part of the justification in terms of his own legitimacy. And as he holds on to that program, it creates problems for the United States because the program remains unchecked; they have about 10 to 15 nuclear weapons is the main estimate. By 2020, they could have between 20 and 100, depending on how fast the program grows. And in terms of missile capability, they're really aiming for survivability and strike (ph). And that is going to add an extra challenge in terms of the dimension of the U.S. problem. And it also, I think, is an attempt to suggest that is on North Korea's side rather than on the U.S. side. MISCIK: Well, we're going to come back, obviously, and talk in greater detail about the strategic weapons that they're pursuing. But let me just ask you, do you think he has consolidated his power? SNYDER: I think it's very clear that he is in charge. The question is whether his rule by fear is going to have anticipated blowback consequences. And that's—the nature of that is that it's unpredictable in terms of timing. But I think he's taking steps that actually, in the long term, could weaken his hold on (inaudible). MISCIK: And, Chris, let me ask you, one of the things that, in the United States, we have a tendency to say China has the most leverage over North Korea. So let's turn to China and look at the options to have Beijing lever Pyongyang and Kim. Are we overestimating that leverage, or how do you see that? HILL: Well, I think China does have the most leverage over North Korea. The question is whether it amounts to anything or not. It's clear we don't have the leverage, and I think the inspiration for the six-party talks was—was predicated on the fact that we could not disarm North Korea on our—on our own, I mean, without getting B.B. involved. I mean, we would not be able to negotiate our way through that. So I think we did need to, and do need to, continue to work with China. It is interesting that—I think there was a panel earlier about China and there's, you know, a lot—lot to worry about in China. But rapprochement with North Korea doesn't seem to be one of the things we need to worry about. I think the Chinese are kind of feeling, you know, the issues there and—and, if anything, have kind of backed off. And I think, importantly, have kind of developed their—their political relations with South Korea in a way that I think is—is positive for the future. I think there are a lot of people in China with a—with a kind of zero sum notion that if North Korea goes down it's a victory for America, it's a defeat for China. So there is that kind of conflict within—within China. There's no consensus on what to do about North Korea. But there's an increasing understanding that North Korea does not provide the kind of stable neighbor and element of the neighborhood that China—China likes. I think—I mean, we'll get into some policy prescriptions later, but I—I think the U.S. has to continue to work with China as kind of a main—main player in this; keep them in the hotseat of, you know, running the six-party talks. I think the U.S. absolutely needs to work closely with—with South Korea. I think one of the reasons we got into the—into the six-party talks as we did was to—was to address the kind of divergence we were having between us and the South Koreans, where South Koreans were saying, well, that's easy for you to, you know, say in New York. But we ought to, you know, be tougher on North Korea. But we live right here. And so we were seeing poll—polling data suggesting that some 40-, 50 percent of North Koreans were blaming us for North Korea's nuclear ambitions. And finally, let me just say that I don't—first of all, I agree with everything Scott has just said about this new regime. There is a lot of discontinuity. One of the issues is that Kim Jong-il, at least before he became Kim Jong very ill in the summer of—summer of '08, I mean, he—he clearly had an interest in pursuing this. I mean, whether had made the—the strategic decision of falling out of bed one morning and deciding to get rid of nuclear weapons. I don't think he did. But he had an interest in pursuing this. And I think it's increasingly clear that his, you know, Caligula-type son does not seem to have an interest in pursuing it at this point, and may have, as Scott suggested, kind of enshrined the notion of not pursuing disarmament. So a lot to worry about in terms of direct negotiations with North Korea. But I still think we need to work with China. MISCIK: OK. In 2012, in Kim's first public speech, he said that his—that working with the military was his first, second and third priorities. So B.B., Pyongyang and Seoul are 120 miles apart. That's less than the distance from here to the state capitol in Albany. There are 30,000 U.S. troops, roughly, in—in South Korea. We worry very much about tensions escalating to a point where they get out of control. What's the scenario that you worry about the most? BELL: Thanks, Jami. I don't know in my studies of military history over the years that I can point to a place with a smaller trip wire that has the least amount of publicity associated with it than the relationship between North and South Korea and the major parties that surround those two countries: China, Russia and then, of course, the United States and Japan. Very, very dangerous and volatile situation that just pops up every now and then in the psyche of American diplomacy and policy, but day-to-day does not concern us like some other areas of the world tend to—to dominate. We're looking at a military with, day-to-day, on the ground over a million men. There are only 25 million people in the country. And, oh, by the way 12 million of those folks are in the military, including the reserves. So half the population is militarized. Unprecedented and unbelievable. And they all have guns and can go fight. So you're talking a huge military with great asymmetric capability; not just conventional capability, but missiles, nukes. They may not have a nuke on a missile, but they can stuff one in an arthroplasty just like we did for Japan and drop it on Seoul any time they want. So to suggest that the missile—the nuke problem is not a big problem until they get a missile is—is far from the truth. The nuclear weapons problem is a major destabilizing reality today. They've go a giant special operations forces capability, about 80,000 people that are highly trained and skilled that can get into South Korea through any number of insurgent techniques, take down the economy quickly, and cause destabilization of—of the South Korean government. So it just goes on and on in terms of the capability. Now, that said, what's—what's the big problem. Well, the big problem is—there are 50 of them, but the big problem—is the northern limit line. A line a bit arbitrarily established at the end of the Korean War by the United Nations Command naval commander really, principally, to keep U.S. and allied ships from bumbling into the 3-mile limit zone, as it was in those days, of North Korea and accidentally starting a confrontation. And—and stunningly, because it wasn't addressed in the armistice (ph) agreement, this order that he put out became a de facto national boundary. And ever since the mid-'70s, when the North Koreans decided to make an issue of the NLL, there have been many, many, many frequent confrontations. The big ones you read about because they almost take us to war. The latest, in 2010, two confrontations where the North clearly sank a South Korean warship, killed 46 South Korean sailor and then just a few months later bombarded one of the contested islands that's just beyond the three-mile limit that is, if you will, owned by South Korea. Bombarded it with several hundred artillery rounds and killed four South Koreans, two military, two civilians and—and injured a bunch of people. So—so the NLL is something that the South views as the only definition of a boundary, and it is the tripwire. The NLL today can take us to war tonight. And it's a shame because there are a lot of reasons to go to war. But because some people disagree over a little island or a little line in the ocean, it's not one that should put the United States into a war with China. But it could. MISCIK: We'll just think about that over dinner tonight. MISCIK: I do want to come back to the strategic weapons because that is a key interest for U.S. policy. And we've had a long and fairly tortured history with North Korea on its nuclear and its missile programs. I wrote down just, you know, some of them briefly. We had an agreed framework in 1994. Then North Korea decided to withdraw from the NPT in 2003. Six-party talks started in 2005. The North Koreans say they'll abandon their program. In May 2006 they do their first nuclear test. In 2007 we get a new agreement to shut down the reactor. In 2009 they walk out of the talks and do their second nuclear test a month later. This is about the time that former Secretary of Defense, Robert Gates, said we're tired of buying the same horse twice. 2012 we get another agreement which they agree not to test missiles, and they break it two months later by launching a satellite, I think, in commemoration of the—the great leader's birthday. And in 2013 we do a third—they do a third nuclear test. So, Chris, you've done several laps on this track. HILL: Well, what are you suggesting? MISCIK: I want options. Where are we going from here? HILL: Well, I—I think the negotiating route is—is very tough right now. We did have an agreement that they would do away with their nuclear—abandon all their nuclear programs. By the way, we didn't distinguish between weapons programs and civil nuclear. We just said all of them. And then we also agreed that at an appropriate time—and we took some—made—made some effort to define when that appropriate time was. We were prepared to talk to them about a civil program. So we basically took the view that we should put everything, you know, sort of all in. You want to talk about treaty on the peninsula, we'll talk about treaty. You want to talk about cross-recognition states, OK, we'll put that—just put it all in there. And in a way, you know, the North Korea—you know, they—they'd want something until they didn't want something. And—and they would demand things such that—you know, there's an old thing in psychiatry that you can—you know, you can never get enough of what you don't really want. And there's a lot of that going on with the North Koreans because they really didn't know what they wanted. They—they wanted some kind of great power status. It's not something we could confer on them; whether we take them of the trading with the enemies list, or whatever. So they kind of played around with those elements and, frankly, they didn't know what to do because they never really did make the decision to disarm. HILL: ...within a day. So, you know, that. I mean, North Koreans are—they—they start the day in a very grouchy way. But I can tell you, by the end of the day it was not very pleasant. HILL: So I think, you know, an important element of the negotiations try to achieve some incremental things: get people on the ground. I don't need to tell you, as a former CIA official, why it's sometimes important to have people on the ground. Because you can do things on the ground that you can't do from outer space or can't do in the Council on Foreign Relations. You can actually do things on the ground, and I mean technically and a lot of other things. So I think when you—when you take this principal position we won't talk to liars and things like that, you're kind of hurting some of your own capabilities. And so I think we need to keep the door open. We need to keep the door open for some of our own reasons, but I'm fairly discouraged about the idea that we can pursue—we can solve this through negotiation. MISCIK: Let me ask in a—a slightly different twist on this. We may be getting ready to sign a deal with Iran on a nuclear program there. What message are the North Koreans likely to take from that, and what message would we want them to take from it? I mean, do we have an opportunity to shape a narrative here—what a horrible Washington expression that is. But do we have an opportunity here to shape a story, or—or what do you think they'll take from it? MISCIK: Started twitching pen (ph)? HILL: Yeah. Oh, my gosh. I think, you know, the North Koreans used to talk to us about, you know, why do you let India have a program. And I'd say, Mr. Kim, there is not enough time in the world to explain to you the differences between your country and India. I mean, that was kind of the way I left it there. I think—I think the—if we're successful in Iran, and I'm sure you've had a different session on that whole subject. And I'm—my own view is, you know, compared to what. I mean, what—what else are we going to do. But let's—let's say we're successful there. I think it'd be a good sign for the—for the North Koreans. But I think we're dealing with a—a regime, I think Scott can speak to this better than I, that just doesn't care anymore. I mean, they're—they're—they don't really look out there in the world. They kind of engage in, you know, Dennis Rodman type stuff. But they're not really—they don't say, Gee, if we could only do this maybe we could be treated more like Iran. I—I don't think that—that's how they're looking at themselves right now. I think it's so intensely insular right now that it does not have as much effect as I'd like it to. BELL: Jami, I don't—I don't want to throw us off track. But also a factor in all that is that at least the Iranians say they are not pursuing nuclear weapons. I mean, that what they say. The North now uses nuclear weapons as a cornerstone of their survival policy. They're very clear about that. That they're not going to give up nukes, that negotiations can be about anything other than giving up their weapons. And that they will use those weapons if they believe the regime is threatened. So it's—it is so different now, in context, of where we are in the two situations that I don't know that it's comparable. HILL: I will say, you know, I didn't have too many good moments with Kim Kye Gwan. I mean, he wasn't the kind of negotiating partner you wanted to pick up and hug. But I—I remember one time there was a particularly obnoxious KCNA North Korean official new service report. I said, "Mr. Kim," you know, "what's that all about? I mean, how are going to proceed tomorrow with that kind of thing?" And he said, "Don't worry about those things. They can say one thing today and they can say the opposite tomorrow and nobody cares." So I—I'm not too worried about declaratory policy, I'm more worried about what they actually do. And I think it's pretty worrisome from a point of view of a negotiated settlement. SNYDER: Yeah. So in some ways, I think that the last thing the Obama administration needs is for North Korea to come in following an Iran agreement and say that's what we want. Precisely because of what B.B. said: that the North Koreans are going into this wanting recognition as a nuclear state. And that's really the core of this is, we've got competing efforts to train strategic choices on each side. We say come back to the negotiating table to talk about denuclearization, and they say we'll come back to the negotiating table if you recognize us as a nuclear weapons state. MISCIK: So if you have (inaudible) a standoff, if you will, in terminology do you—do you find a way to change the terminology? Do you find a different way to go at it? You don't just keep beating the same argument that hasn't worked in the past? HILL: I really don't think this is a case of sort of finding a clever sentence or a clever, you know, process to get through this. I—I think it's really a state that is not interested at this point in giving up their—their nuclear weapons. If they were to decide to give up their nuclear weapons tomorrow they would find a way past some of the statements that they made yesterday about this. So I'm not too worried about that. What I'm worried about is every indication we have is that they are trying to miniaturize nuclear weapons, they're trying to develop the missile technology, they eventually want to marry up a nuclear weapon with a missile. In fact, claim to be able to do that. I doubt they have—I—I have no doubt that they will continue to do it until they succeed. So that is the problem we have: how to get them off of this. I don't think it's a question of finding formulations at the negotiating table. I think it's a question of getting them to understand that their lives would be better without these weapons than with them. SNYDER: So the further along the road we go on this track, the more the North Koreans are trying to shape archways between either acquiescence to North Korea as a nuclear state. Or the other option is regime change. And I don't know if there's a diplomatic way of build a coalition for regime change. I have a feeling that the Chinese wouldn't go for that. SNYDER: The quiet discussion about alternative leadership. HILL: I think they could have a quiet discussion with someone like B.B. or B.B. 's successors to talk about, you know, what we would do and what we wouldn't do in the event of a—of a kind of political meltdown in North Korea. I think the Chinese would—would listen, I think there's some scope for that. BELL: No, it's a great—it's a great point. One of my big issues, and it was—it's always a big issue is, if we get into a tussle with North Korea how close to the Chinese border do you bomb? Ten feet, 10 miles, 20 feet, not at all? What if you miss and it goes over. I mean, so you're into this very precise, presidential-level targeting, which we hate. But you got to do it because dear Mr. President, the chance of us starting a war with China are about 50-50. Well, he would like it zero-100, please. So the—the risk of miscalculation if something goes hot and things escalating astronomically very quickly over there—given the weaponry that's in place and the sophistication of weaponry, let there be no doubt. For those who think North Korea's a bumbling little backwoods country that doesn't have sophisticated weapons they're wrong. It doesn't take a lot to teach a 7.62 bullet to kill somebody. It can come out of an old World War II gun or a modern 2015 gun. It does exactly the same thing it's always done. So the North Koreas are very capable, highly skilled, militarized country. And if something starts, and the diplomats and—and the leaders of the countries can't get it under control, we could be in a very serious confrontation with Russia, China. Believe—are you ready—Japan, and—and our whole diplomatic thrust in East Asia could come unglued quickly and the United States could be at great risk. HILL: ... in a kind of redacted way with some of these military plans, what they are and what they're not. BELL: I—I—I wanted to do that. I wanted to go to Beijing and say look, how close can we bomb before you all get really upset because I'd like to—I'd like to know that. BELL: Well, (inaudible) go to Beijing (ph). No. Which we did. MISCIK: Well, I think that is one area where we are in agreement. That the—you know, talking to the Chinese in a very quiet, behind the scenes, diplomatic, military, intelligence channels about interests that we share. You know, they don't want to see chaos take place on the peninsula, we don't want to see that. We don't want to see nukes go loose on the peninsula and fall into the hands of others. They don't want to see that. We also don't want to trip over each other trying to get to them to secure them. So I think all of those—those points are important. HILL: And we should be encouraging this South Korean-Chinese relationship. I know there's some people who'll think, oh, this is part of a process of South Korea sort of drifting out of being a close ally. I don't think it is at all. I think it's very leveraging for us. So I think we should be encouraging that. And when the Chinese finally come to an understanding that their lives would be more stable with a Republic of Korea as a successor state than with this kind of Caligula-led place I think they will—they'll be more open to listening to ideas. BELL: We actually agree. And, oh, by the way, North Koreans are not dumb. They're very smart. I mean, they're obviously very smart. Where do you think they've built their most sensitive military sites, some of them? Within feet of the Chinese border. It isn't because they love the Chinese. It's because they don't want us to bomb those should war start. And I'm just saying that philosophically, but they're always thinking about action, counter-action. You know, how are they going to split the alliance between the United States, Japan and South Korea. How do you split that? So their whole missile approach is to have—a missile defense approach is—is about how to split that capacity so that if war were the start that there would be a likelihood of confrontation between the allies, thus preventing us from mounting a positive effort. They're very smart folks up in Pyongyang. They know what they're doing. SNYDER: I think the North Korean survival strategy is premised on the idea that they can take advantage of that geostrategic gap between the U.S. and China. Because ultimately China's also thinking about end state. And so what I'm worried about is maybe North Koreans have made a miscalculation; they think that we have no choice but to acquiesce. That's a possibility. MISCIK: Well, let me follow up in a slightly different direction. The—the new leader is very young. He could be around for decades. You know, waiting him out may not be a winning strategy. So are there areas where with can see ways to make, you know, positive, collaborative, cooperative advances? Maybe—maybe literally very small baby steps. President Park of South Korea was supposed to be here—well, supposed to be in Washington—on Monday. She had to cancel her trip because of the outbreak of MERS. Is public health an area where we might be able to make some—some progress? And—you know, and that's the one I can think of and throw out there. But are there others that we should be thinking about? SNYDER: I think public health is absolutely necessary, and nutrition as well. And I'm ashamed of some—some of the meetings I sat through in Washington, where people talked about withholding food aid as a means to—to get North Korea and the behavior to change. As if starving children are going to, you know, convince the regime there to disarm. So I—I think absolutely it's necessary. And one of the, you know, relatively few human moments I had in North Korea was talking someone from the foreign ministry who'd be working with the U.N. on tuberculosis issues. And, you know, he kind of let it slip how moved he was by the fact that these people from all over the world were in his country trying to help deal with this tuberculosis problem they—they continue to have there. So I think it's absolutely necessary. And for, you know, people who think we're being too soft, et cetera, there are a lot of good reasons to get people on the ground. Just people should always remember the fact when you're looking at a—an enigma like North Korea. MISCIK: Are there other areas other than public health? SNYDER: Give me a week and I'll think of one. I mean, I—I've—I've always supported what the South Koreans were doing in Kaesong. This idea of having some, you know, modest industrial facilities. I think it helps the South Korean economy kind of move away from some of the labor intensive industries that they still have. But I think it also speaks to the fact that North Korea's problems are more than just the problems of this Kim family. I mean, they don't have accountants, they don't have people that can do regular things. And I am of the view that I don't know when, I don't know how, but someday North Korea will join the world. And maybe as a part of South Korea. And we're going to have a lot of—a lot of issues there that go deeper than the Kim family. BELL: It's really one of the great questions if we could just—if we just knew the answer. Because we have so many examples in the world where economic development has turned the regime at least into someone you could talk to. Look at China, look at Vietnam, our—our deepest enemy. Yet our goals in Vietnam were largely achieved if you look at it today. Our political goals in Vietnam, if you look at it today, were largely achieved. Not—not that that's as a result of anything we've done correctly, but they are. So—so, you know, you would hope, if you could plan a little factory and if some poor farmer whose, you know, kids starved last week could get a decent job and—and up their standard of living, somehow this might—might have a positive impact. So far, all efforts to make something like that happen over the years have not worked, and we've been disappointed. But it is a matter of human nature to want to improve your lot. Somehow, getting to the people of the Republic of North Korea, and—and sparking an economic turnaround is a pony to be sought, I think. And I—I'm not sure that I have any idea how to get at it. But if we knew that answer, that's a real pony. HILL: I served in Albania in 1991, which is kind of a North Korea of Europe. And what happened was, the government essentially ran out of money so they couldn't pay the collective farms. So the farmers in the collective farms would take their little vegetables or whatever, and go out on the roadside and try to sell them that way. And before you knew it, as they started earning their money by selling it on the roadside, the farms they started putting up fences where their grandfathers' farms were. And before you knew it collectivized agriculture was finished in—in Albania. And I think about a year later they had a reform law put through to enshrine the—the changes. So when you see some of these, you know, pathetic sights of people in North Korea sitting on the side of the road with three rotten apples trying—they're trying to sell you have to pay attention to some of this stuff. Because it's worked elsewhere, and I don't rule out that—you know, North Korea is unique, but some of the processes going on there are not unique. And I—I would not be surprised if there are changes. SNYDER: Energy security is another area that (inaudible) agreed framework is actually premised on that. But really, the critical thing that we need that we don't have right now is there's certainly not a debate inside North Korea, based on the current approach about which direction that they should go. Because they don't see anything from the outside that can be used to effectively kind of counter the self-isolation. SNYDER: No. But—but, see, that's the thing is, well, exactly. So is there a way, you know, to create a situation where there's—where they actually feel that there is an option. Because, I mean, denuclearization under the current terms, you know, if you're in the elite you're going to hang together rather than hanging separately, right? MISCIK: Well, the Economist magazine, in February, I think, wrote a piece saying that there were tantalizing signs of economic reform taking place in North Korea. The—the very point that you were making, Chris. They focused on family farming being allowed to take place more than collective farming for the state. In Washington, we have a tendency to kind of worst-case scenario a lot of things and go to the—the darkest options, and—and plan for those. And rightly so because if the were to come true you'd—you'd have to have a plan. But do—do we run a risk of missing some of the positive signs that might be there. You know, when you talk to people who have traveled to Pyongyang now versus 10 years ago they comment on the change that they see; you know, the access to some cell phones. You know, those types of things. Are we—are we painting it too black? SNYDER: My own sense is that there are plenty of nongovernmental organizations that can kind of engage in that space without the U.S. government having to do an—an about face. I think flexibility on the government's part would be interpreted as weakness by the North Koreans, and I'm not sure would really help us a lot there. I'd certainly like to see a little more activity from the U.S. government on this, but I really think that those kinds of things are best handled through a kind of NGO process rather than through the government. SNYDER: The Achilles' heel, I think, of our current approach is really what if the current strategy that Kim Jong-un is pursuing is actually his best attempt at an economic reform strategy. Maybe he'd like to hold on to the nuclear weapons in order to keep North Korea from growing too rapidly. Maybe he knows that rapid growth is actually as dangerous for him as stagnation. MISCIK: OK, well, I've tried to get them to put their happy face on. Let's open it up to your questions. I think you know the drill by now. Wait for a microphone, stand up, identity yourself. And let's start right over there. QUESTION: Peter White from the Southern Center for International Studies in Atlanta. I wonder if the panel could comment on the physical condition of the average North Korea. I'm under the impression that some time ago dwarfism set in. And also the impression is that, from what I've read, that a—there's a great cultural divide between the North and the South. They don't even speak the same language in many cases. And, of course, the experience of North Koreans that have defected to the South has not been very favorable. SNYDER: So if—when you see South Koreans and North Koreas interacting with each other at international conferences it does feel sometimes a library like back to the future. The South Korean young people are talking to people in North Korea who are—have a mindset is—that is similar to the way that Korea had been in the middle of the 20th century. But in terms of the specifics, you know, units (ph). There—there have been nutritional surveys done in North Korea that show very clearly that about a quarter of the population surveyed is facing wasting or other signs of malnutrition. It's even worse in the countryside. And these surveys are not done on an independent basis. These are self—these are individuals that have been surveyed in partnership with the North Korean government. So it could actually be worse, certainly worse in the countryside. You know, this is not a government that is going to win anything in terms of governance. And clearly, the loyal are the ones who are rewarded. HILL: I—you know, it was interesting. I—I—I think when you see North and South Koreans together you do see this height differential. I mean, there is a—almost a physical difference these days. But what I was struck by was the fact that there—there has not been the kind of cultural difference, like language differentiation that you alluded to. I spent a lot of time in the Balkans, and you know the Croats wanted to make sure that their version of Serbo-Croatian was as different from the Serbs as possible. So, you know, the—if you used the word "hilep" in Croatia, which means "bread," the Croats would immediately get on you and tell you to call it "kruh," which is the—their—you know, their—their word for "bread." They're very interested in differentiating. You don't really see that with the North Koreans. SNYDER: There's a little bit of it. HILL: But surprising—I mean, there's this idea that we North Koreans, we are the sort of keepers of the true Korean flame. You know, we haven't allowed—you know, foreign-borrowed words to come in. There's a little of that. But there's less than you'd think. So I think it's—it's kind of a—a mixed picture. But certainly, allowing people to starve and—and seeing what you described as dwarfism is—is something the South Koreans have worried about. Because their operating assumption is that eventually it's going to be their problem within their borders. SNYDER: I'm from the State Department. Do we compete with you for resources? BELL: You—you—you take the million men and women who are in the military, and they're much better nourished, they're much more disciplined, they're much happier, if you will. Indeed, while they do have conscription, obviously, only 10 years. When you get drafted it's not for 2 years in the North Korean military. It's 10 years. It's OK because now you have access to the greatest percentage of the economic wealth of the country. Military first. So you have this strata in North Korea between the military and, of course you got the elite first, then the military, and then everybody else. And it's stunning as opposed to what we're used to of mostly there's a level of equality of—of economic well-being, physical stature. It's—it's amazing up there, it's just stunning. QUESTION: Don Gregg. I'm former ambassador to South Korea. Three sort of amusing facts. Kim Jong-un was a great Chicago Bulls fan. He tried to get Michael Jordan and Michael said no. He went to Scotty Pippen, and Pippen said no. And so he finally went to Dennis Rodman. So that's—he's sort of the third. At a meeting earlier this week with North Koreans, they absolutely echoed your feeling of how hostile they feel toward us. And he was asked are there any areas where things could get started. And he mentioned immediately a resumption of the POW-MIA body retrieval. And I would suggest that that was one of former secretary of defense's worst decisions to end that. And I would urge that we maybe get going on that. Third fact. China is a—there's a study coming out of Harvard now. China has sent $1.5 billion in hard currency to North Korea last year for anthracite coal. North Korea's become the world's largest exporter of anthracite coal and China is their major customer. And they are doing it so that it does not register on our sanctions. I was in Seoul three weeks ago. We took Gerhardt—Volker Ruay (ph), a former defense minister for Germany, to talk about East-West reunification. The Koreans, on their own, had Gerhard Schroeder, former chancellor of Germany, who talked about the same thing. I think there is a growing realization on the part of some South Koreans that nobody can reunify their country for—for them. I think they need to get at it themselves. And there was a meeting of national assembly last week, where they said they were going to form a bilateral commission that would work out a policy toward North Korea that would survive changes in a presidency. So I would say all is not lost, but I certainly agree with you that at this point the chances of any resumption of good dialogue between us and the North Koreans is zilch, at least as far as the rest of the Obama administration. HILL: Just one other thing of that—the cultural differences. We—we—we had a fabulous ambassador in—in South Korea, Kathy Stephens. And Kathy, earlier in her—in her career, was a Peace Corps volunteer in South Korea. And so this is in the mid-'70s. She would walk past students, all of whom were in sort of military type uniforms—South Korea. And when they would see her as a teacher they would salute her and say down with communism, salute back, and on they'd go. So these kinds of things that—this kinds of marshal living which you see in North Korea, you know, in South Korea not so long ago. BELL: This—and I just got to say, this program to get into North Korea with U.S. teams. U.S. personnel, mostly—many soldiers, but from the POW identification unit (inaudible). To get in there and go to these Korean war sites, and find remains of servicemembers—American, South Korean, and et cetera—you know I could not agree with you more. Had great merit, and it—it actually provided a—a—a way to have a little bit of dialogue about something that wasn't, you know, really hot. The dialogue (inaudible) remains. And yeah, you know, they really started restricting our activity. It was really egregious, et cetera, et cetera, and we just backed away from it. But it is an area where I think if you want to start something again in North Korea that is such a humanitarian issue that it has to be a place you could at least ask the question. MISCIK: OK, back here on the aisle. QUESTION: Hi there. Kian War (ph) from the xwise (ph) foundation in Los Angeles. I was in North Korea six weeks ago, and while we were there the defense minister was reportedly purged and executed. Can you comment on what may have happened behind the scenes or what happened there? BELL: Well, it was—in front of the scenes it was an antiaircraft round right through the chest. But behind the scenes—no, I—I don't mean to make light of it. But what—what it says is—and there's—there's every indication that that purge did take place and that—that—that he's gone. There have been so many purges since Kim Jong-un came in. and it—it is a huge military issue. Because as you try to study your opponent, if you will, and gain some understanding, where their triggers are. And all you see day-to-day is—is the next person gets purged, and then somebody pops up for a week, gets fired, then rehired. It's just—you—you—the ability to make some sense of it all is very complicated. So you have no choice except to go to Kim Jong-un himself, a youngster who is still yet ill-defined and say, whatever he says, apparently, to stay in power is going to work. And that's the only guy we can study right now because nobody else is impacting the guy. MISCIK: I noticed that no one has fallen asleep here today, though. QUESTION: Hi. I'm Lynn Novack from the Tower Center at SMU in Dallas. Not being an expert on North Korea, I have read a book, a novel, that came out a few years ago called The Orphan Master's Son. And also I have read that not only has he been purging people like his uncle, but that his uncle was fed to wild dogs. There's been some dispute over that, but I'd like to hear your comments about how much of this stuff actually is factual. HILL: Maybe they're developing nuclear weapons as a sort of execution device or something. SNYDER: I—I think the story about being fed to wild dogs was a case of a U.S. news agency getting Onion'ed by a China parody site. So in that particular case it's a little bit more exaggerated than the reality. But we're still trying to sort out what happened with the defense minister. I think that, you know, this—that—that's—story in terms of how he was executed, it's more complicated to assess at this point. But—but it's clear that he's gone and there's a churn. Kim Jong-un is clearly in control, but he also is clearly fearful of something. BELL: But it—it is common. When you want to get rid of your opponent or someone who opposes you, and you're also trying to send a message to everyone else who could oppose you. And so to make these purges particularly brutal is normal in the world. Obviously goes back—and we—we would like to think that we've grown beyond that, and perhaps the United States has. But countries like North Korea have not grown beyond that. They still use the most gruesome forms of death as a way to send messages. So it wouldn't surprise me for a second that it were wild dogs. I—I—I don't know if it was or was not. But sending messages to anybody else that might get strange ideas about taking down the new great leader would be done in the most brutal way, I would believe. HILL: ... and—and then killing him the next day is a little unusual in any terms, including North Korea. MISCIK: Some of the public members are up to 70 people have been executed at—in that kind of leadership circle. (UNKNOWN): (OFF-MIKE) that was described in that novel. Have any of you read the novel? SNYDER: Yeah. Well, it's fiction. Adam Johnson did go to North Korea and absorbed, I think, some of the atmosphere on his tour. As a result of the novel, the tour operator can't get back into North Korea, interestingly enough, you know. But it's—I—I think that, you know, it is an—it—it's a novel, it's an imagined space. But he is also addressing real aspects of the psychology, I think. You know, in some ways I think being in North Korea as a North Korean, it's kind of like being boxed in by an electric fence but the electric fence is moving. Sometimes it solutions (ph) up and sometimes it tightens up. But as a result, you're stuck. You're really afraid to venture out and take too many risks. MISCIK: Let me go over here. HILL: Well, first of all I didn't—I want to make clear I didn't say "regime change." I think that is a term I'd like never to hear again in this world. Especially in policy circles. But I think it's fair to say that, you know, North Korea's future is not bright and not endless. And I think at some point there could be a collapse in North Korea. And there will have to be a successor state, and certainly we want a situation in which China is comfortable with that successor state. You know, I—I once met some North Korean defectors in my—in my office in—in Washington. And I—I asked them, I said let me give you four scenarios and ask you which one might work in North Korea. The first is, you know, factory workers get tired of lack of spare parts, lack of salary. They board themselves up in the factories, police refuse to intervene: that's Poland. The second one is, you have a—a crowd at a football—at a soccer game, they're upset with the ref, and before you know it they're upset with the—with the regime, police don't intervene. That's Albania. And then you have a party meeting and some drunks come in in the back, start yelling at the party first secretary, police don't intervene. That's Romania. And the fourth, you have the party gets together and decides to have multiparty elections. That's Hungary. So they kind of huddled up, and they said, well, definitely not that last one. And they sort of really thought about it, they have this discussion, and then someone—maybe that thing about football, maybe that could do it. In short, no one has any idea how that could really happen. And, you know, I think whenever you talk about North Korea you're at best making an educated guess. And, you know, I can imagine some process within the civil and military authorities maybe happening because of this kind of—these—this—this use of terror, which I think is a sign of weakness. But however it happens, whenever it happens I think we need to be ready. And we need to be ready with a sort of comprehensive understanding with the Chinese, a kind of mutual deep dive on that. I mean, we certainly didn't have that in 1950, and so I hope we can do a better job this time so that, you know, we—the Chinese understand what we are going to do ahead of time, what the South Koreans are going to do, what the outcome would be. I think it's very necessary, and—as a successor state. But no, I'm not talking regime change. BELL: But—but that being said, think of the dilemma you give the commander. Not you, but the—the commander's (inaudible) mission says the president of the United States and the president of South Korea. And—and they do mission: to turn North Korea with a strong alliance and a strong military capability so that they won't start a war. Second however, should that fail, defend aggressively so that they will not penetrate egregiously into South Korea. And then third, end the way on our terms. Sounds like going to Pyongyang to me. End the war on our terms, I mean. And so all of a sudden you're—you've got a commander out there who's defending and deterring. And then going on the counterattack to change the dynamics once and for all. And then it happens. You march into Pyongyang and you take down the regime, and everybody's standing there saying, Well, Fred, you're in charge. No, Joe, you're in charge. And without some kind of diplomatic agreement well before something like this happens—where the big parties have a real understanding, better than the understanding at the end of World War II. That one didn't work. Then we're—we're looking at that. So it's one of the great questions that needs a lot of attention so that should the worst nightmare happen that we have some way to—to proceed other than walking into a mess again. MISCIK: OK, all the way in the back. QUESTION: Laurie Garrett of the Council. Three hours ago Al Jazeera reported that North Korea's on an alert of some sort. Because Dugway Proving Ground, U.S. Army (inaudible) lab in addition to shipping live anthrax to four other countries apparently shipped it to a military lab in South Korea. And North Korea is interpreting this as some sort of biological warfare malevolent intent. Comments? BELL: Well, I—I can't give you the details of what happened because I'm not sure anybody knows yet. But there is a real biological threat posed by North Korea in their warfighting arsenal to the allied forces in the South. Consequently, there are countermeasures always being reviewed against a range of biological agents to ensure that we have a way to deal with it should it be employed against our forces and the South Korean forces. It's my understanding—well, I know for a fact that those—that the dead anthrax, not, closed paren, was shipped to Osan Air Base, U.S. air base, not South Korean air base, where we have labs where they used these kind of materials, dead, to make sure that our readiness is where it should be. Obviously there's been some terrible screwup, big time, over the years with this biological agent, for its use in—dead use to ensure that our stuff works right so we can detect it. So yeah, Chunhyang (ph) will probably try to make some issue out of this. But never forget, the United States does not use biological weapons as a—as a—as weapons of war, period We don't. Second, we must be prepared to defend ourselves against those kinds of weapons because other countries do profess to have them and will use them. North Korea is one of those other countries. MISCIK: So Chris, what would be happening now in Washington? What kind of talking points would be going out to the U.S. ambassador in South Korea for you, or now Mark Lippert, to relay? HILL: Well, I'd send B.B. there. I think that was pretty clear, and I think the restatement of that policy. MISCIK: How about very back on the other side there? SNYDER: Yeah. I think we have a number of them, but none better than our current negotiator in the six-party talks, Song Kim (ph). I think Song (ph)—he was our ambassador in South Korea. He—he knows the Korean Peninsula like the back of his hand. I—I think we're—I think we're pretty—in good shape with expertise. The people next to me, as well. I mean, I—I think we're—that's—I—I think that's a comment that goes for another—a number of countries around the world. But I think with respect to the Korean Peninsula we have some really good people. MISCIK: OK, how about back there? QUESTION: Hi. Farah Stockman with the Boston Globe. Can you shine any light on the obsession in North Korean with the movie industry? And can we leverage that in any way to our advantage? SNYDER: Well, I guess we tried last year. HILL: I'm—I'm—I'm sure the North Koreans wanted George Clooney, but they got Seth Rogan. Probably fitting. I mean, the really interesting other personality out there that seems to have an attraction for the Kim family is actually Eric Clapton, who his—Kim Jong-un's older brother periodically shows up as a fan to their concerts. But—and he's been invited, I think, to Chunggang (ph), actually. SNYDER: You know, I—I think it's a part of the world that is very much interested in celebrities, whether it's in Japan or South Korea or China. I wouldn't be surprised if North Korea's not immune to that. MISCIK: Right here in the front row, for a change? MISCIK: Could you identity yourself? QUESTION: John Conner from West Palm Beach. A collective is actually a private entity as opposed to a state farm. And a watershed moment in Russia was when Gorbachev issued the joint venture decree. And I'm wondering, based on basketball or moviemaking or some activity that would be attractive to them whether or not there might be a possibility for some sort of a joint venture. SNYDER: There are some limited business interests, joint—joint venture type interests Certainly, China-North Korea border there are Chinese investments in some North Korean mines. There's also reportedly, in Chunggang (ph), a couple of aeries (ph) that have benefited from external investment, actually from Singapore I think. And there's reportedly some Italian investment there. QUESTION: Kathy Ward from Coronado, California. Could you talk a little bit more about the cyber component? Both how that affects the overall playing field, and how it affects our sense of what our options are, as well? BELL: I will start that. North Korea has one of the most capable, well-formed, experienced and operative offensive cyber capabilities on this planet, period. Much of which, I might add, it is said in public domains—is actually run out of a location where they function in China. I will tell you—and—and you all know, I mean, everybody's that's read anything knows that many of the cyber attacks that we've suffered over the last years it has been, you know, rumored that they emanated out of North Korean capability. They have—when they realized that conventional conquest of South Korea was not in the cards they went asymmetric; whether it's nuclear weapons, you name it, chemical, bio they've gone h head over hills into cyber world. This is the greatest risk, in my view, to the allied forces, from a military perspective and certainly, beyond that, an economic perspective that we face with North Korea today. We're not well prepared for it. I think our classified networks are because they're very encapsulated. But most of our economic enterprise is not a function of encapsulated classified systems. So they picked the ball up in a brilliant way. They're way out in front of many countries in terms of offensive military capability. And it is a great risk, and I am very concerned about it and I think every American should be very concerned about it. Cyber world, and there's been some conferences or some gatherings here about this, is not the emerging problem. It's here, it's operating, and somebody's going to pull a big trigger one of these days and we're going to be standing around wondering what happened to all of our money. And it's not going to be in New York anymore, it's going to be somewhere else. MISCIK: OK. Back there? There you go. QUESTION: Bob Inman, Austin. Emphasizing the rule of non-attribution. MISCIK: We are being recorded. QUESTION: In a dialogue with a very senior BOA official this past year, I raised the question of—the speculation that they should be planning with the South Koreans on an implosion in North Korea. His response was there are dialogues, but we will not let North Korea implode. And I pressed a little further, and he said you didn't understand me. We will not let North Korea implode. HILL: Well, I mean, I think a lot of Chinese feel that they cannot let—cannot let North Korea implode. But if we can draw any lessons from, you know, 1989 and all that whatever the Soviet Union felt about these—these shifts in—in places like Poland it happens fast, it happens in an unpredictable way, and it's really hard to stop. I think what your PLA contact may been suggesting is, they have their own plans for moving in. Moving in with force. And that is why—that is precisely why we need to sit down and talk to them about that. Because what I could imagine is a scenario in which there's a new 38th Parallel, but moved further up and that you have a new division. I think it's important to understand, though, that China—I mean, everything ever said about China's true. I mean, it's vast, it's complex, et cetera. And I think China would also look at the—the international reputational risk—let me put it that way—to, you know, hiving off part of North Korea. And I think it would be a decision made at the highest level in China. So, again, I think it speaks to something B.B. and I have been harping on today, which is, you know, we need to sit down with the Chinese and unfurl some of these plans and talk about them. MISCIK: OK, one more question here. QUESTION: And they have a museum which shows their so-called Victory Museum, talking about our war atrocities in the 1950s. Up to the Framework Agreement, where they will say it was Congress failed to support the Framework Agreement back in '94 and '95. And we were really the original violators of that agreement. On up to things like the axis of evil that President Bush's speech, and so forth. Up to last August, when an American general announced they're holding war games right on the border, practicing a preemptive invasion of North Korea and a quick capture of Pyongyang. And they keep asking me about that. And I kept telling them there's no reaching out on our part. There should be more tourists going there like I went to talk with the people. There ought to be ways—they ought to silence the general that says things like that. And we ought to try to give them our side of our history. And we just don't seem to be doing that. BELL: But—but don't forget, sir, and I couldn't agree with you more. I think your comments are well stated. That said, the propaganda approach by the North Korean regime to keep its people in line is based on the premise that there is about to be an offense strike tonight by the United States, led by the United States, to take them down. It's the way they keep their people in line. So they will say and do anything, and they do it routinely. Now, how do we counter that? Well, we counter it with the truth if you want to. That's what we did during the Cold War, as we tried to penetrate the story that the Soviet Union was professing to its own people and to its satellite countries. But all those plans and efforts to talk to the North Korean people and tell them the truth about free economic enterprise, et cetera, et cetera, about the truth that we have a defensive plan, not an offensive plan, all those efforts are on hold right now. And we're not, in an aggressive way, trying to communicate with the North Korean people. I think it's a shame, and we should be. But it's provocative for us to do that, and therefore we don't want to provoke something. SNYDER: I want to stress, too, in the September '05 agreement we put everything on the table. We were just all in, we were prepared to do treaties and any kind of addressing of broader issues on the Korean Peninsula. You know, and with respect to the axis of evil comment, I mean, I—I—you know, I—remember, it included Iran. I mean, you know, 4,000-, 5,000-year civilization and we call it an axis of evil. I mean, I—I have a problem with that statement as a general proposition, but I want to stress the North Korean nuclear program was well in operation way before they had their feelings hurt by the axis of evil comment. So I—you know, I—and this issue of a hostile policy. I mean, they told me that a million times as their reason for why they needed nuclear—nuclear weapons. And, you know, I told them a million and one times that we don't have a hostile policy to North Korea. We have a hostile policy to your policies. BELL: And they know we don't have a hostile policy. I mean, they know that. It's just how they keep their people in line. SNYDER: And, you know, I—I went to North Korea. I remember going down the subway, which is about twice the distance of DuPont Circle in Washington. SNYDER: And I remember—oh, it's huge. It's a—it's a bomb shelter, I think, to be—just to get that on the targeting list there. But, you know, I went down the escalator. BELL: Could you (inaudible) on the map for me? SNYDER: I'll—I'll help you with that one, yeah. HILL: All you need is the Google map. SNYDER: The Chinese embassy is not there, though. BELL: Oh, then forget it. SNYDER: But, you know, going down the escalator, these people coming up. And I was smiling, waving at everybody. And all the kids would wave back, and the parents would kind of yank them away from me. I mean, it was—I think the hostile policy is coming from them. MISCIK: Well, I think we're going to have to leave this where many mock—actually many official National Security Council meetings wind up. Which is, we're going to meet again, we'll study it some more, we'll think about some options. We'll have intelligence write a couple papers, we'll have Defense go plan something. But I do want to make one announcement here so that you know your next task. I am to remind participants that buses will be leaving for dinner immediately after the program here. Exit the hall at the front or the back, and the buses will be loading outside both doors. And in particular, I want to just take the opportunity to thank what I think was a really terrific panel.